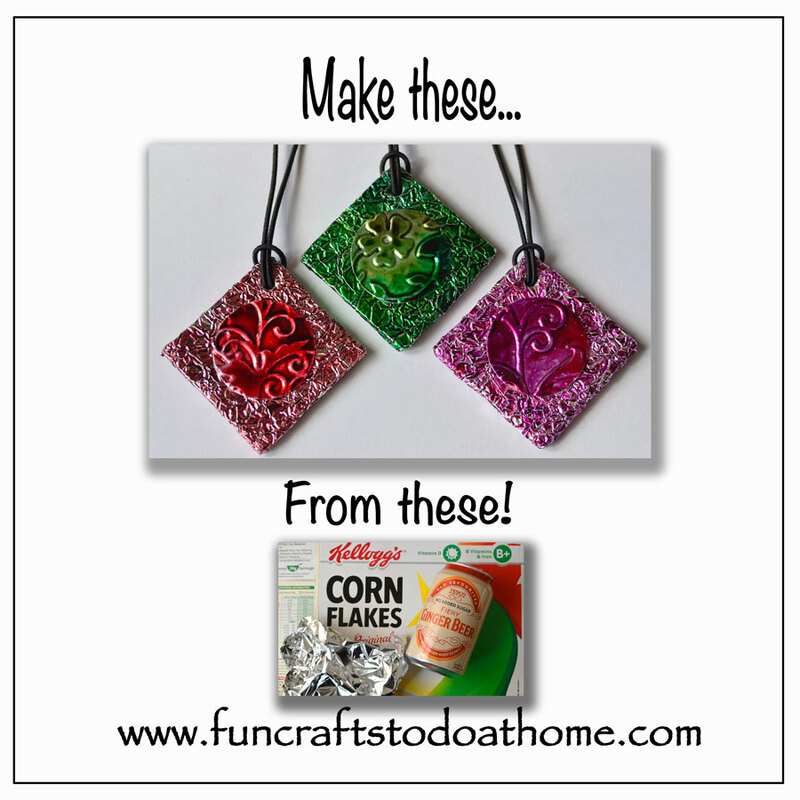 Embossed Tin – Make Pretty Pendants From Junk! 15th September 2017 by Gilly·Comments Off on Embossed Tin – Make Pretty Pendants From Junk! Embossed tin is easy to create if you have a machine like the Sizzix Big Shot (expensive!) or an embossing tool and mat (not so expensive). If you want to see a step-by-step guide to how I made these pretty pendants from a recycled cereal box and a soda can, click here to see my short, easy to follow video on YouTube. These beautiful pendants were made using embossed tin from a soda can. In my previous post I showed you how to make pendants with no bezel or tray. In this post, I show you a fun project I designed for using up any scrap card or cereal box card as another way to make pendant bases. The square base I made from card was then covered in aluminum foil that I had hand colored using alcohol inks. I also used embossed tin to the make a backing for the pendants which means they are reversible. On one side they have a round embossed tin design and on the other they have a square design covering the whole surface. It doesn't matter if your pendants flip round while you are wearing them! I used a 2 inch square punch to cut the embossed tin backing so that gaps in the tin foil would be covered up. So that means there are two faces to the pendants, each with a different look. I used a Sizzix Big Shot to create my embossed tin - but what if you don't have one? No problem! You can emboss the tin using an embossing tool with an embossing pad underneath. When you use embossed tin that's been created using an embossing tool, it obviously isn't as crisp as when you use an embossing machine. But, the designs will be unique to you and still look very pretty when colored with alcohol inks. Have fun making your embossed tin pendants! Watch my video tutorial by clicking this link to YouTube and then have a go at making your own. To help you source the same kind of products I used, I have put links below for both UK and US readers. If you want to find supplies like those I use in my YouTube Tutorial, visit my Amazon Craft Supplies page. I try to source the best products, closest to those I use myself. If you try this, I hope your pendants turn out really well! If you have any questions about the process, try watching my tutorial on YouTube. Working with embossed tin is a great way to use those empty soda cans - have fun while you are saving the planet!